Although we are looking forward to our long planned white Christmas, oh wait green Christmas, with our “kids” Alex and Nick, while house sitting in Vermont it will be a much quieter holiday than last year. Last year’s holidays were spent in Nicaragua while we were living in San Juan del Sur, Nicaragua and we took advantage of the time with Nick, visiting for six weeks prior to a trip to S.E. 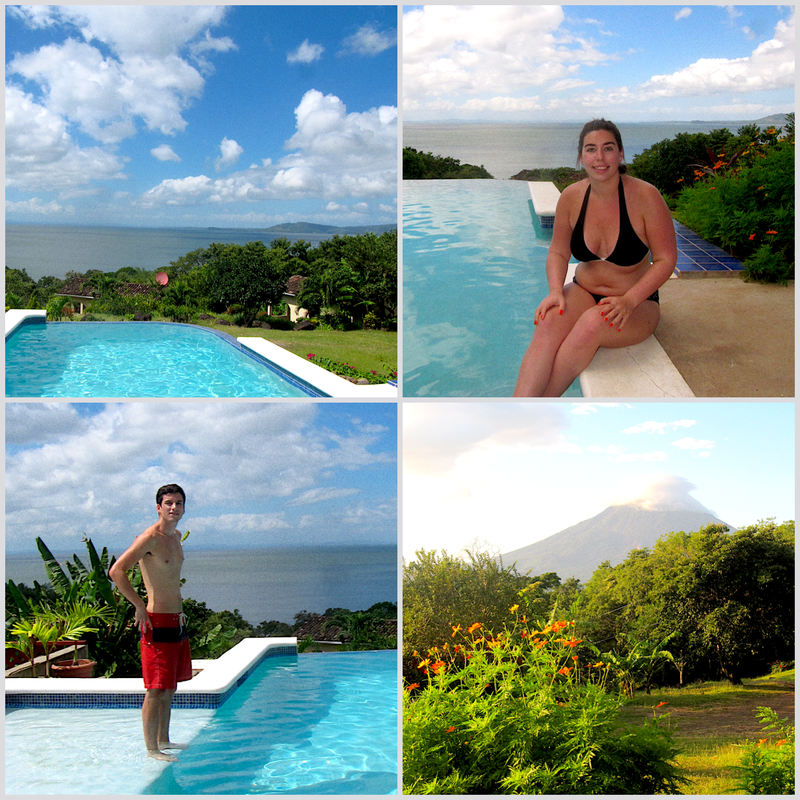 Asia, and Alex on a three week break from university to explore many of Nicaragua’s stunning destinations. So, we will take the opportunity of the quiet here in Vermont to look back on last years adventures! Exactly a year ago we travelled to the stunning Isla de Ometepe which is an island formed by two volcanoes rising from Lake Nicaragua. Its name derives from the Nahuatl words ome (two) and tepetl (mountain), meaning two mountains. It is the largest island in Lake Nicaragua. The two volcanoes of Concepción and Maderas are joined by a low isthmus to form one island in the shape of an hourglass. Ometepe is 31 km long and 5 to 10 km wide and has a population of about 42,000 people. The island has an economy based on livestock, agriculture and tourism. Ometepenicaragua.com will give you great information on how to get to Ometepe and where to stay as there is a great range of spots varying from luxury (for Nicaragua) to basic hostels with the prices ranging from $4 USD for dormitory rooms in hostels to $290 USD for cabins in ecolodges. 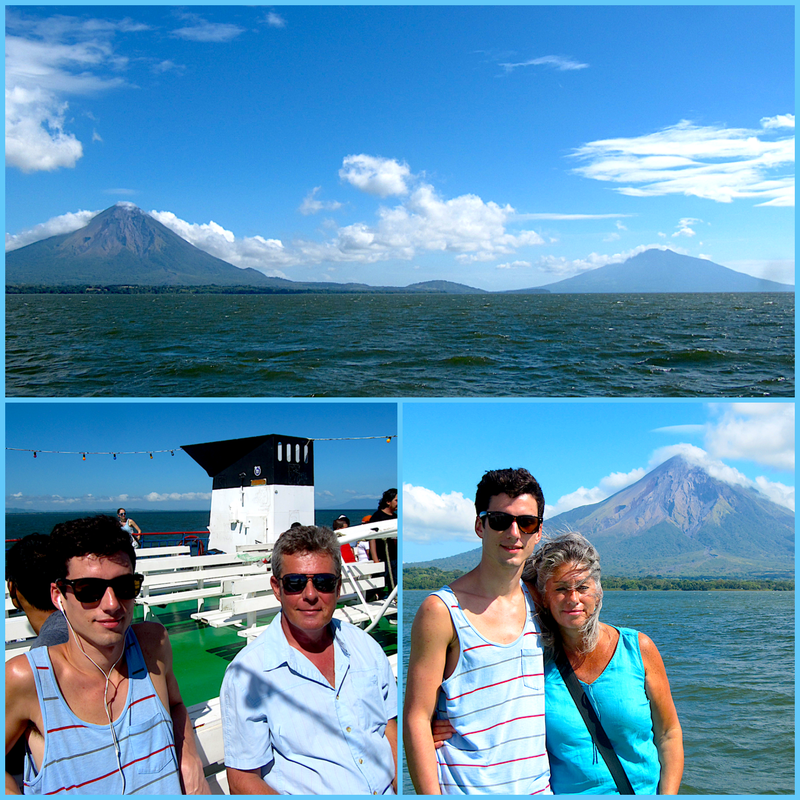 Jeremy, Nick and I on the ferry to Ometepe with Concepción Volcano in the background. Concepción Volcano is on the northwest half of the island. 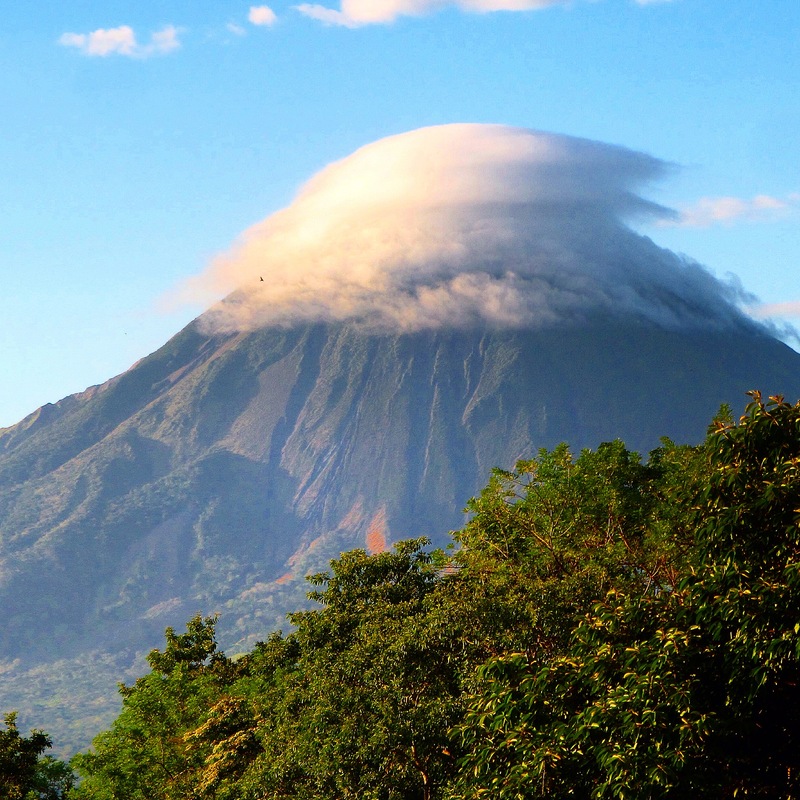 It has a symmetrical cone and is an active volcano and now reaches an altitude of 1610 m making Ometepe the world’s highest lake island. Concepción is considered the most perfectly formed volcano cone in Central America. In 2005, an earthquake measuring 6.2 on the Richter scale occurred as a result of increasing pressure within the volcano. Cracks appeared on roads throughout the island and believe me we learnt they are still there today when we toured less traveled portions of the island. This was the first minor eruption since 1999. The most recent eruption was in 2010 and although it was extremely violent, few of the inhabitants followed the Nicaraguan governments warnings to leave. The southeast half of the island consists of Maderas Volcano, which has a crater lake and has a rainforest environment. Maderas rises 1394m above sea level. It is considered extinct or possibly dormant. The sides of the volcano are mainly covered with coffee and tobacco plantations while the remainder is rain forest. Much of this part of the island is now a nature reserve. The volcanic ash has made the soil of this island extremely fertile, allowing continuous planting. The volcanoes are visible from everywhere on the island, and life on Ometepe revolves closely around them. 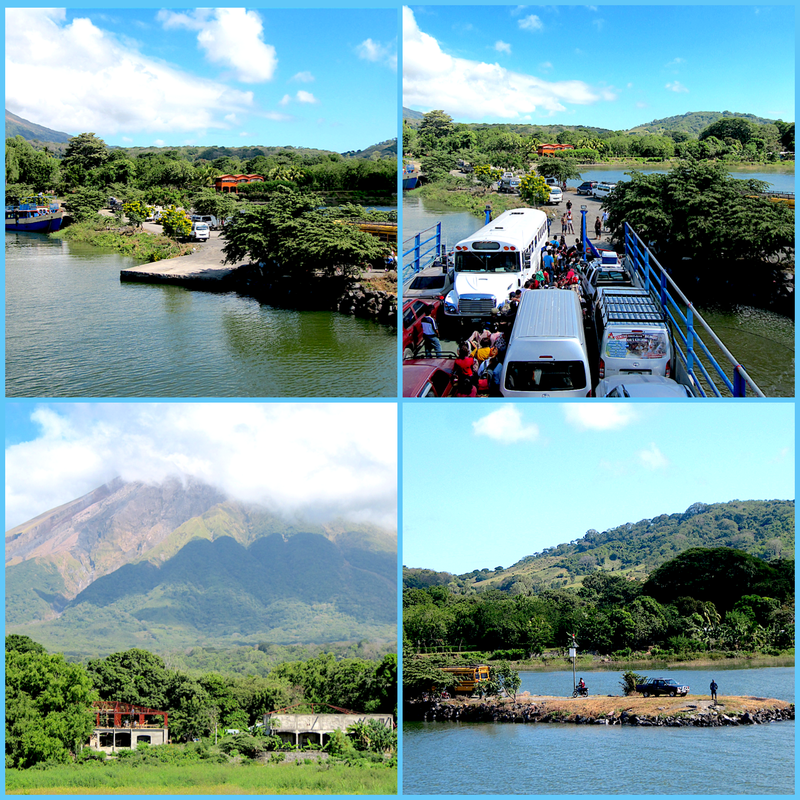 Arriving at the ferry dock at San José, Ometepe. We left for Ometepe exactly one year ago today from San Jorge about a half hours drive from San Juan del Sur and took the 80 minute ferry ride to San José, Ometepe. This was a thoroughly pleasant experience as the weather in December is probably some of the best of the year, not too humid with lovely breezes and we were lucky to have not too choppy waters as Lake Nicaragua is so big you feel much more like you are on the ocean versus a lake. Lake Nicaragua has an area of 8,264 km and as mentioned above it is the largest lake in Central America and is the 19th largest lake in the world. We then took the scenic hour or so long drive along the isthmus to La Omaja Hotel where we had booked a family bungalow for about $65. USD. The hotel sits in the foothills of the Maderas Volcano in the middle of the Maderas Nature Reserve. The Omaja Hotel has absolutely breathtaking views of the lake and both volcanoes and is within easy reach of some of the great hiking, biking, kayaking, riding and of course swimming that Ometepe is known for. 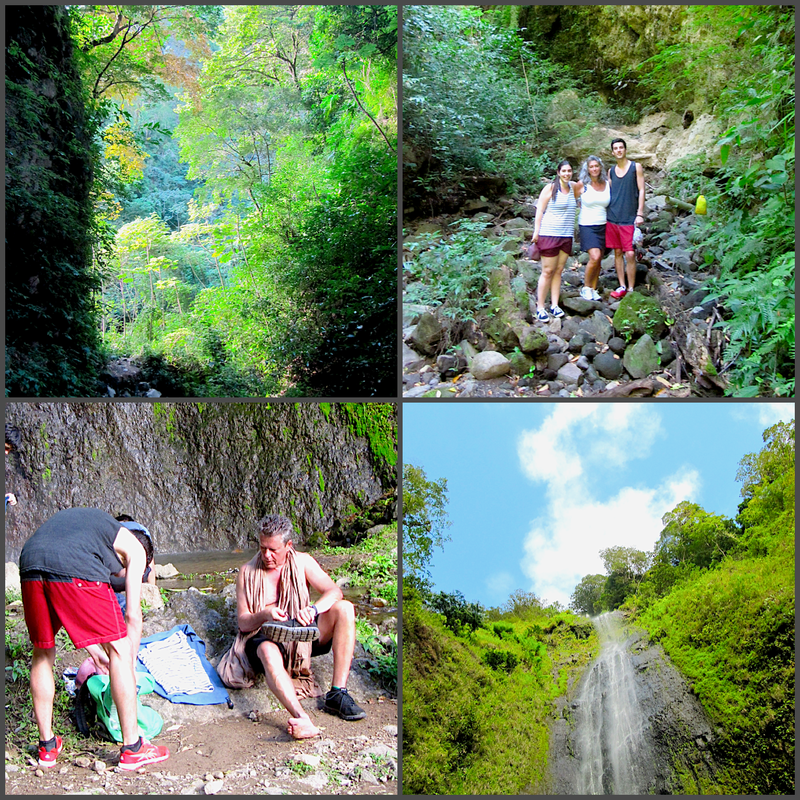 Hiking to San Ramon waterfall. We didn’t hike either of the volcanoes as many people who come to Ometepe come to do as they are full day serious hikes. Having hiked Mombacho Volcano when vacationing in Nicaragua years ago we were familiar with exactly how strenuous that can be and we just weren’t feeling that energetic…so we just enjoyed the views. However, we did hike part way up the side of Maderas to San Ramon waterfalls which was a workout in itself and enjoyed the much needed cooling off in the falls when we got there! Loved cooling down after hiking and enjoying the views from the pool at the Omaja Hotel. We also spent time kayaking on Lake Nicaragua enjoying the birds and monkeys on some of the tiny islands offshore. We also stopped at one of Ometepes most well know attractions Ojo de Agua which is a natural spring pool filled with crystal clear water from an underground river that comes from Maderas Volcano. The swimming hole is rimmed with cement to form two separate swimming areas where the water gets renewed constantly by the spring that emerges from the bottom of the upper pool. This is located in the middle of a forest type setting although recent years the Ojo de Agua has become popular with visiting tourists and local families so that on some days you find it pretty crowded and loud. What was once a hidden secluded swimming hole has suffered because the owners removed most of the big old trees in the surrounding forest and put in a restaurant and souvenir stands etc. Having read about its previous seclusion we were disappointed with the development but still enjoyed swimming in the warm waters. Coming back to this was just heaven!!! We spent three nights and explored most of the island and it was a thoroughly enjoyable time which I would recommend for those who enjoy nature and active outdoor activities. It’s not a trip, in my opinion, to do on a short vacation to Nicaragua as part of its charm is just enjoying the scenery, people and activities at a leisurely pace but if you have the time it’s definitely worth the visit. Previous Vermont…It’s All About The Cider! Central America is on our minds for 2016. Thanks for the very descriptive post, great to have family time in a beautiful location.